At We Fix Computers located in El Paso, Texas we take pride in repairing, servicing and selling all makes and models of laptops and notebooks. Our computer laptop and notebook repair services normally take about a day. 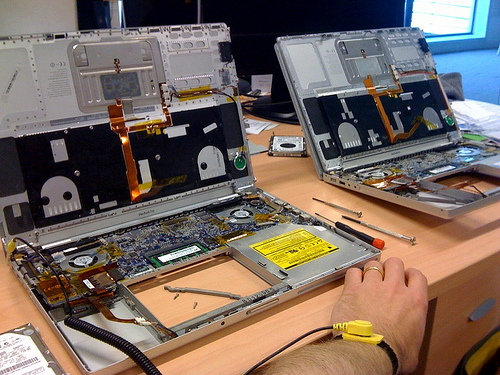 There are many items that can fail causing you to need your laptop repaired or serviced. We Fix Computers works on hundreds of laptops daily and we take pride in having the most experienced computer laptop and notebook service techs. All of our locations offer free estimates so get your laptop repaired by a local computer laptop technician today. There are many parts that a broken laptop shares with desktops. They are not interchangeable but the concept is the same. For example, a laptop that comes in for repair because of a bad hard drive shares a similar hard drive with a desktop except in miniature. 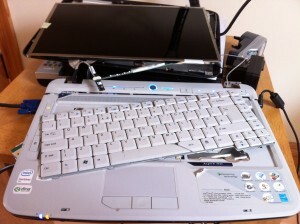 Another reason that people bring in their laptop for repair is because of a broken keyboard. The keyboard layout on a laptop varies from manufacture to manufacturer and the cost of a replacement laptop keyboard is comparatively high when compared to the cost of a desktop keyboard. When you bring your broken laptop to We Fix Computers we can tell you if your broken laptop is worth repairing. This is the biggest advantage of hiring a local computer repair company, We Fix Computers. Some of the most common problems a computer laptop can face are viruses. A computer laptop can get a virus from the internet, from a computer flash drive or from an email. The tech’s at We Fix Computers can do the laptop virus removal and offer you the best course of action for your laptop. We Fix Computers can also provide you with an affordable Antivirus solution that will help prevent your laptop from getting viruses in the future. A virus removal at times, can be the most frustrating laptop repair that an end user will face. Another reason you may want to bring your broken laptop computer is to get the hard disk drive upgraded. All laptop and notebook computers that come in for repair have a hard drive. We Fix Computers can upgrade this hard drive on your laptop to a solid state hard disk drive. This upgrade is performed by local computer technicians and will definitely make your broken laptop a whole lot faster. You can rest assured that We Fix Computers is a local laptop repair company that can offer you honest local service. Don’t forget that We Fix Computers offers free laptop repair estimates as well. You can visit either of our locations at 1506. N. Lee Trevino Suite I or 1830 N. Zaragoza Suite111, or if you prefer you can call us at (915)629-8888. If you want local laptop repair service, you want We Fix Computers.